That was odd, bordering on cringe-worthy. Why don´t they (de kongelige) interact with the people? Why do they just stand there for half an hour? Why that weird distance? That whole scene is a bit like at a zoo, when people come at the animal´s feeding times to watch get tossed a bit of food. Only here it´s flowers. It looks odd from this angle. But it is a horse parade, and safety of all people present, noble, or not, are at stake. Ok, so they were watching something - that explains parts of it. But they could have still walked over and greeted the people who - after all - were there to see the royals, not the horses. It was not a photo call. It was just a parade with horses etc. like every year. The Danish magazine "BILLED BLADET" called it this year's summer photo session at Graasten! 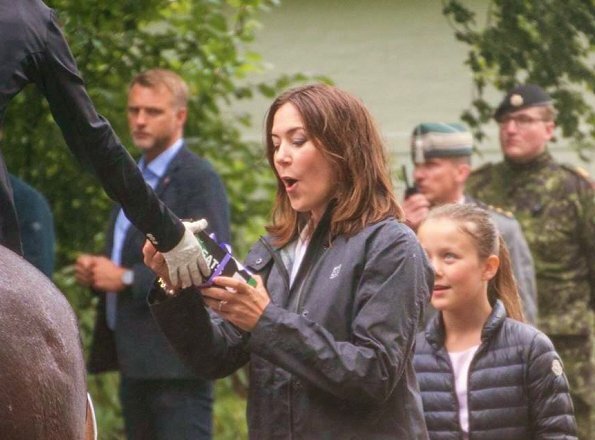 "There is something rotten in the Royal Family of Denmark". Mary and Frederik do not deal privately with Marie and Joachim only when the Queen demands them to stand up together! 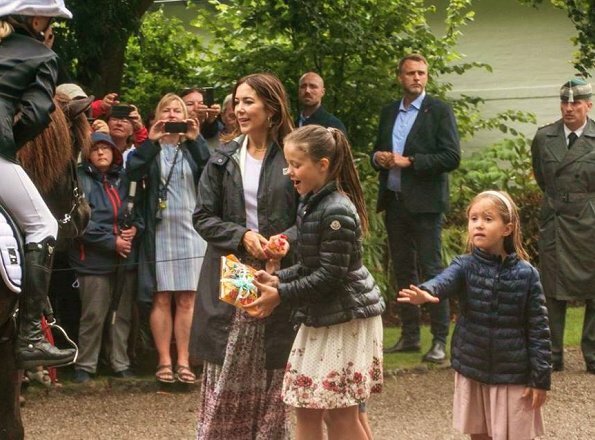 I know, but they were also on holydays in France six days in June, when the Crown Prince of Japan was on six days official visit in Denmark! Mary and Frederik were hosts… and they were not invited to the gala dinner etc. If meeting Danish people on holydays abroad, they are saying it has been going on for years and now they don't hidden it anymore. But we will still see them on jobs together as long as The Queen is head of State. I see the Queen is going incognito today. All she needs are a few sparklers spitting and sparkling in each hand - look at me!! Nobody mistakes her for somebody else. 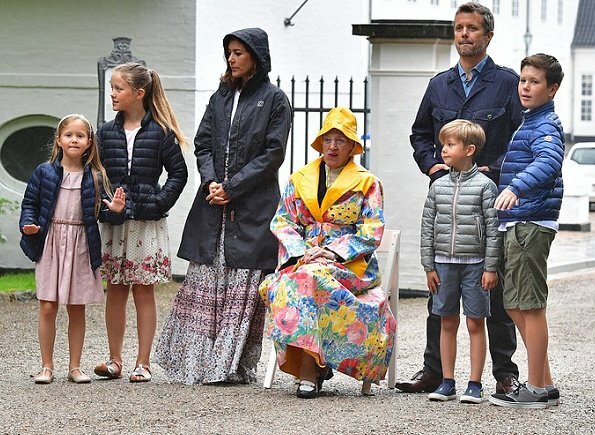 In the top picture look as if they'd rather be somewhere else, or maybe they are just embarrassed to be next to the queen wearing the worst possible horrible raincoat! I wonder why Mary chose to wear a long flows skirt on a rainy day. Very impractical. 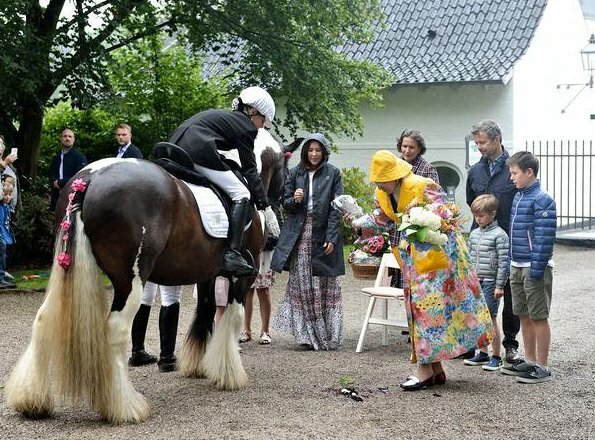 The queen looks very odd in that rain outfit. It's as if she tries to choose the weirdest possible thing. 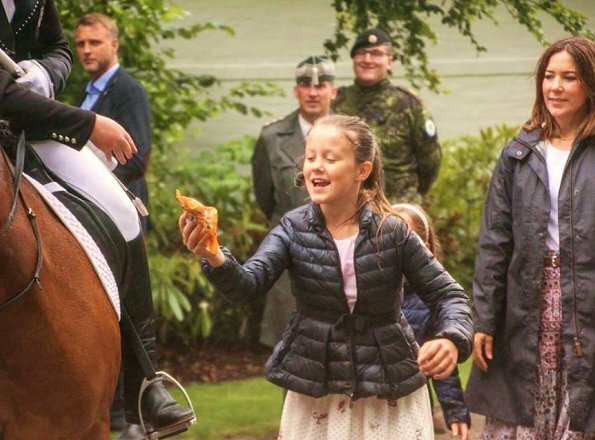 Queen Margrethe never fails to disappoint, does she? At first her raincoat struck me as a bit odd, but the more I look at it, the more I start like it. Only she could pull something like that off. 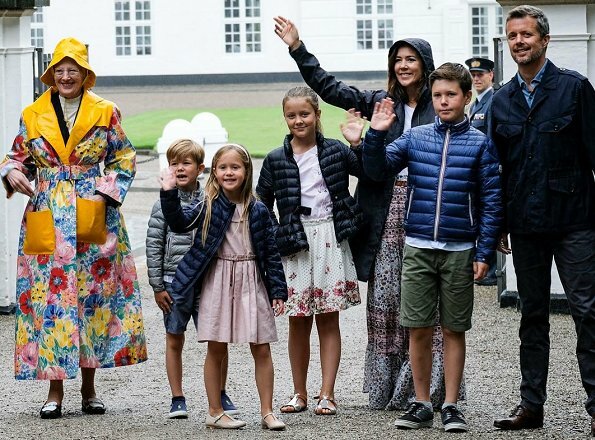 I think Queen Margrethe raincoat, hat was lovely, and brightens up the day, and if she enjoyed wearing it, good on her. What they all wear, is up to them. Common sense tells you that they do not get too close to the horses, for obvious reasons. so true, thank you Judy Morgan! 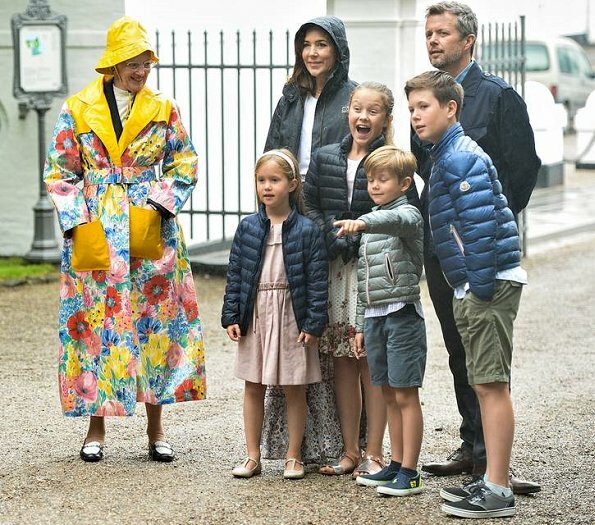 Queen Margrethes coat is a very special 'Friesennerz' - I like it.